Add a savory side to your breakfast with this potato recipe from the Dinner on the Grounds cookbook. 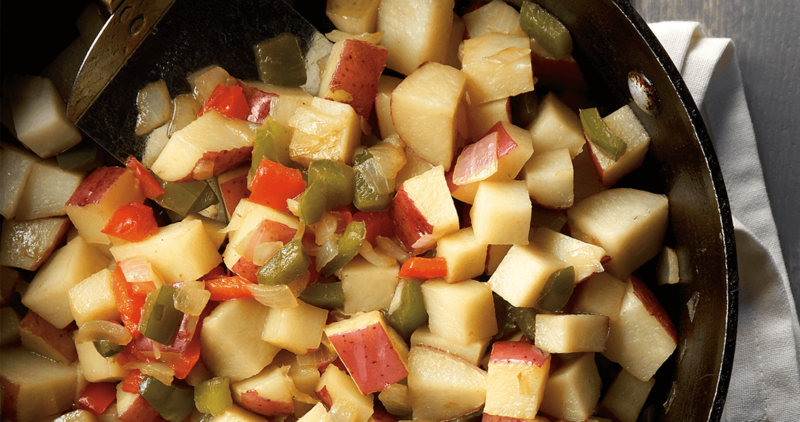 In a skillet over medium heat, sauté the onion, peppers, and potatoes in oil for 4 minutes. Combine broth, Worcestershire sauce, and salt; pour over vegetables. Cover and cook for 10 minutes, or until potatoes are tender, stirring occasionally. Uncover and cook until liquid is absorbed, about 3 minutes. To purchase a copy of Dinner on the Grounds, visit preserveoakridge.org. Cost is $20. For several years, Our State featured recipes from the pages of community and church cookbooks from around North Carolina. These dishes continue to be among some of our most popular and enjoyed.